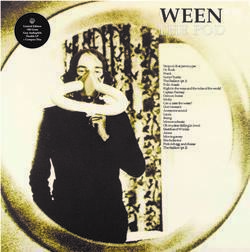 (2-LP + CD) The Pod was recorded by Dean and Gene Ween on a Tascam four-track cassette recorder between January and October 1990. The album was then produced and mixed by Andrew Weiss and for this edition re-mastered by Howie Weinberg at Masterdisk. This is a 1,000 copy limited edition run on grey vinyl and comes with a compact disc as well. This edition will never be re-pressed in this format. Most often considered the band's "challenging album," The Pod (named for the apartment Dean and Gene shared in which all of the album's songs were recorded) is probably the band's most surreal. All of the songs have a murky, sludgy quality to them, possibly due to being recorded on a four-track, and many of the vocals are manipulated in strange ways. The lyrics are also quite druggy and bizarre.